The 80s were when I came of age in this industry. 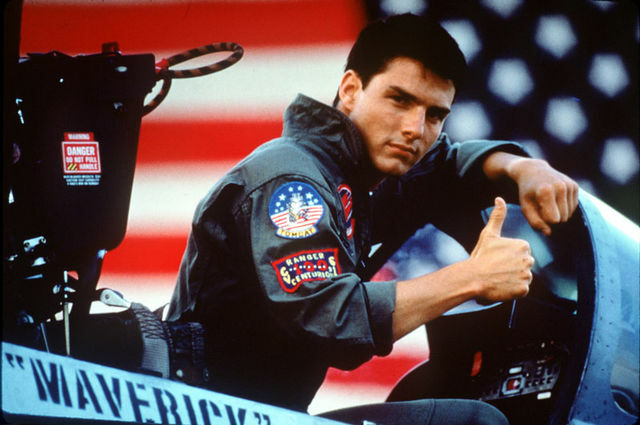 Top Gun was the highest-grossing movie of that decade, and my oldest son was born in 1986 after his mom’s water broke while we were watching it in a theater. She claimed it was because of the twisting and gyrations watching the F-14s on the big screen. I’ve always secretly thought it was just because of Tom Cruise. It was a fitting analog to my time in this industry, my accidental career in marketing was often equivalent to flying at high speed, without much of a safety net. I buzzed the tower. A lot. Coming off the “thrown into the fire” aspects of my first job in the technology industry (at SoftLink, starting in 1981) as discussed in my prior post, I’ll accelerate the discourse in this installment. Fast forward to 1983. My time at SoftLink had run its course, because unfortunately SoftLink itself had run its course. Too nascent of a value proposition, a great idea ahead of its time, and a lot of fluidity in the market at the time all conspired to kill us, while other companies such as Lotus (with 1,2,3) and others began a consolidation, largely around the IBM PC and MS-DOS, which also killed CP/M and many smaller PC makers, and really hurt Apple as a business platform for many years. I found a new role in the marketing department of another small start-up named Westminster Software. Westminster had a product in market called PertMaster. No, it wasn’t a hair care product, it was project management software. Shortly after I joined and had to immediately learn about project management (Gantt charts, for the win!) and showed some capability as a young marketer, they told me that there was a plan to enter an entirely different market, with a new product that they had developed called PagePlanner. PagePlanner was a page layout and design product that ran on IBM PCs on MS-DOS. PagePlanner was used to design pages for printing and then output the pages directly from PC to typesetting machines. 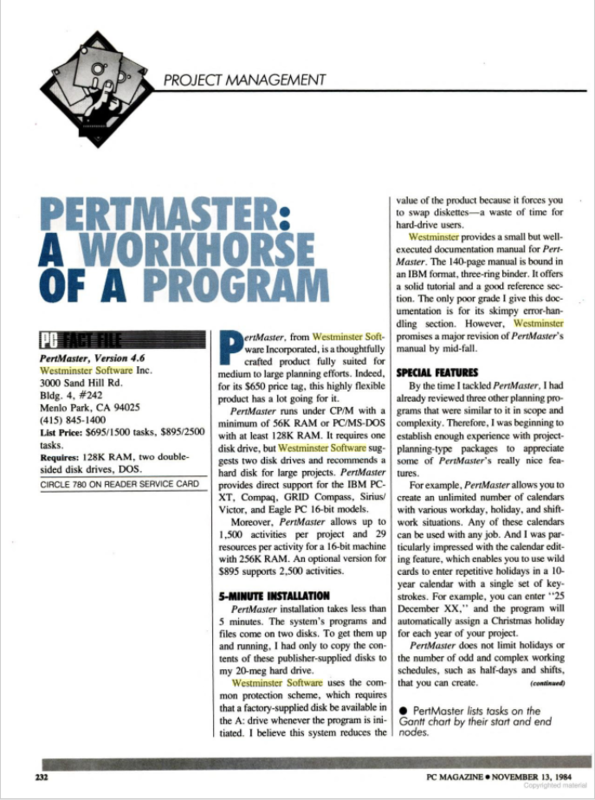 A review of Westminster’s PertMaster, from 1984. It’s amusing now to read the things reviewers focused on the early days. Until that time typesetting was a big business, with specialized shops where “craftsmen” typesetters laid-out pages for newspapers, brochures, books, really anything printed. The first generation of typesetting was manual, using lead letters arranged by hand. The next generation had machines that did that using pre-built fonts that were driven by large systems for newsrooms, publishing houses, etc. Our new thing was to replace these old dedicated systems with PCs, which were cheaper and simpler to use. We’d plug the PC directly into the typesetting machine, and output galleys. This was before WSIWYG (What You See Is What You Get) screens or software (like we all are used to now), it was simply using text copy and a formatting “language” on a “green screen” like any other program of the time, but the output looked like a fully laid-out page. Because I had some experience with printing (as a young marketer in the era before the web), the idea the company had was for me to move into a role as a “field engineer” and go out on sales calls and to big printing industry trade shows and demo the product and help sell it, even do some POCs (athough I don’t think we called them that, yet). I did that for about a year, and it framed so much of how I view sales, and my desire to always make selling the focus of marketing. About the power of good demos that solve business problems, etc. This was all new ground for me. I had no typesetting background, no sales expertise, no demo skills, had to learn the formatting language, had never traveled for business and my arms were frankly too skinny to handle carrying around the 35 pound Compaq “sewing machine” style portable computer I had to wrestle through a lot of airports (Oh, I also was terrified to fly). So, I was forced to be inquisitive and to learn how to become an expert in an area I knew little about. The arms I just gave up on, and used as an excuse to complain a lot. A Mergenthaler Linotype Automated Typesetting Machine, Circa 1980. This is what PagePlanner connected to, and what I had to demonstrate with. 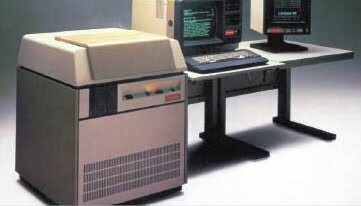 By the way, at the same time we were building PagePlanner, another small start-up down the road named Adobe was working on a thing called Postscript that enabled you to do what we were doing, but without the typesetting machine – going straight to a newfangled thing called a laser printer. That came out about the same time Apple brought out the original Mac (which had a WYSIWYG screen), and then they followed-it up with Adobe Illustrator, and these combined to effectively disrupt, and eventually kill the entire typesetting industry. That was also the end of Westminster. Another idea ahead of its time, but this one was done in a vacuum (not realizing the market shift). Without the internet, it was pretty hard to even know what someone was building in another garage somewhere else in Palo Alto, and the threat it might present. We have so much more information at our fingertips today. I landed on my feet at a company named GRiD Systems. 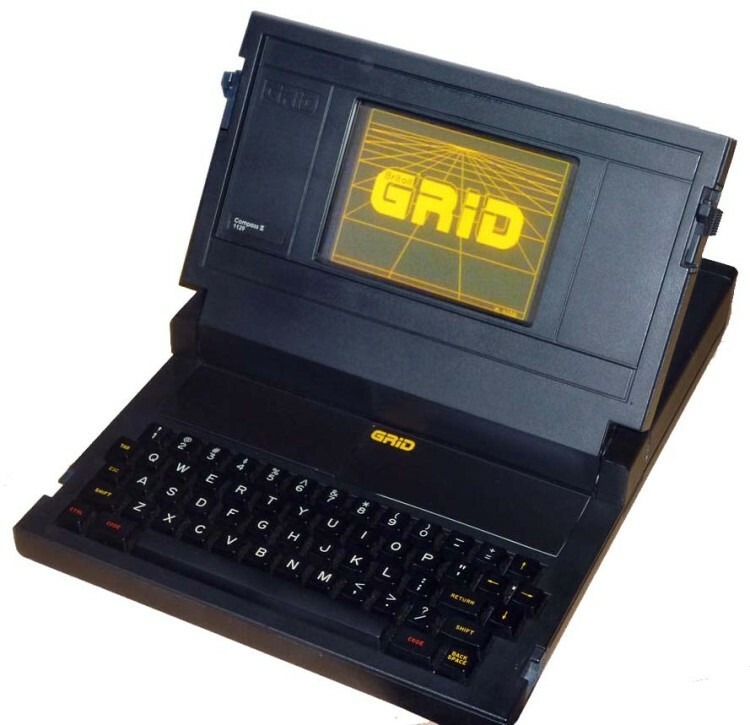 GRiD was the first laptop company. I was finally with the leader, not the follower. Our products were magnesium-cased laptops that were ruggedized, featured secure specifications (so data couldn’t be sniffed) and were used on the Space Shuttle and by the White House Communications Agency – I even got to visit the White House for the 1st time (Reagan was president, I didn’t meet him, I went straight to the basement where WHCA is based). They were cutting edge, amazing devices for their time, and we had our own suite of integrated software that ran on them, until we then moved to Windows when Microsoft introduced it. This was 1984. I was excited because the thing weighed only 10 pounds, after I’d lugged around that dumb Compaq for a year, so I instantly related to the value proposition. I even got to do a case study about astronauts on the Shuttle, and another about how scouts for the Toronto Blue Jays were using laptops to make their jobs easier. That was the closest I ever got to that pro baseball career. The original GRiD Compass. I have some funny stories, like when Vice President Dan Quayle’s secure device came back for service, and the only software loaded on it was a racy game called “Leisure Suit Larry”. True Story. I learned so much about going to market, and doing so in a competitive space, and I really refined my marketing skillset, because I had that one year in the field selling. By now, there were direct mail campaigns, seminars and we used slides. Not from Powerpoint (it didn’t exist), we had a company that did graphic design and put them onto actual 35mm slides we used carousel projectors to show. Sadly, one of the big learnings I had was from a PR crisis, when a new disease became newsworthy, as it was killing a lot of gay men. Its name? Gay Related Immune Deficiency syndrome. GRID. Uh oh. That begat “crisis PR” at it’s finest (that I watched, observed & learned from), that our name likely only recovered from because someone NOT Gay (unfortunately) succumbed to it. The name of the disease was subsequently changed to AIDS. I also first became a manager of people at GRiD, and I had the chance to hire my own team – one of whom later became one of the first sales people we had at Tealeaf. The big takeaways were more influential on me long term, though, even though I only just realized it. The first was that I reported to a marketing leader who had zero marketing experience, he was brought in from sales. We collaborated well, and I became really in-tune to the idea of sales & marketing being joined up – which is a secret sauce of my own I’ve applied to my career ever since – the idea that marketing ONLY exists in order to help sell something. I also got exposure to our chief scientist, a guy named Jeff Hawkins. Jeff is probably the smartest person I’ve ever met – a true visionary. In 1989 Jeff created, and we brought to market, a product called the GRiDPad, a tablet computer with handwriting recognition capability. 1989. For some context, Apple introduced the iPad to the market in 2010. This was 21 years earlier. In fact, as I alluded to in the first part of this series, Apple itself brought out a tablet called Newton in 1993, but it failed. It was amazing to be part of launching this, and we did really fun, innovative stuff. But, a couple things happened at GRiD beyond the day-to-day that stick with me to this day, and form the basis of so much of my desire to “go where the puck is going, not where it is”. The first was the day in 1987 that John Morggridge, GRiD’s president & COO, called a company meeting to inform us all that he was leaving to be CEO of a new company. We were dumbfounded. Why would anyone leave a company that was “changing the world”, right at the height of our story? When asked where he was going, he answered: “to a small company started by a husband & wife that’s building networking equipment”. We all laughed. “Networking? You mean connecting a few computers together in an office to share disks and use a common printer?” Why would you leave a company building these amazing computers for that? 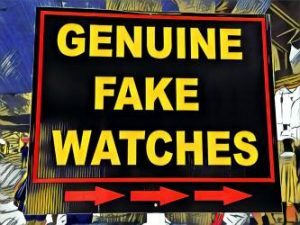 When asked the name of the company, he said “you won’t recognize it. It’s Cisco”. Morggridge had a vision for where the puck was going. He could see that the market we were in was already becoming commoditized, and that everyone was building laptops (and frankly that tablets were a long way from becoming really useful). He could see what the rest of us apparently couldn’t – that networking was the pre-cursor of inter-networking, and of the Internet itself. Which Cisco (largely) built the backbone for. Morggridge was CEO & Chairman of Cisco until he retired in 2006 (he was replaced by John Chambers), when Cisco revenue was $28.4B. GRiD was acquired later in 1987, by Tandy Corporation. For those that don’t recognize the name, Tandy was the parent company of Radio Shack. The same Radio Shack that still handwrote receipts in their stores and gave out punch cards that earned you a free battery after 10 purchases. On our first day as part of Tandy (our really cool Silicon Valley laptop and tablet pioneer now being seen as Radio Shack by everyone, including us), the CEO of Tandy told us (in his Fort Worth, Texas drawl) “that when he woke up in the morning, he knew he had 4 competitors in the whole world – IBM, Motorola, AT&T and Jap-ANN”. A lot of resumes began to be worked on immediately. Worse, over time the plan was to move us all to Texas. Jeff Hawkins recognized that his vision for pen-based (tablet) computing and handwriting recognition was going to be wasted at Tandy, they didn’t even want to enter the next stage – handhelds. He left and started a new company named Palm Computing, where he created the Palm Pilot. Later he started Handspring, and also created the Treo (the first real non-Blackberry smartphone). Jeff saw where the puck was going, and he wasn’t content to play where the puck was. Jeff is now a world-renowned expert on neural networking (the basis for handwriting recognition), and how the brain works. Some of his research and theories inform some of Clicktale’s Digital Body Language thinking, through our behavioral science team. I didn’t really recognize how much influence either John Morggridge or Jeff Hawkins had on my career until I set out to do the talk at Clicktale’s kickoff that spawned this blog series. It was then that I really recognized they had demonstrated for me what vision really means – and the power of looking forward to the future. I also realized when getting ready for my talk that this all took place at the same moment in history that Wayne Gretzky was famously skating to where the puck is going to be, not where it is. In Part 5, I’ll touch on my time after GRiD, and how the evolution continued to shape my career. As you can tell, much of my story is about vision (sometimes unrealized) and timing, and continuos learning and inquisitiveness.